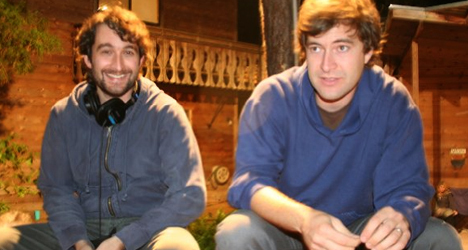 Filmmakers Jay and Mark Duplass on the set of their new dark comedy "Cyrus." Comedian Jonah Hill plays the title character, a 21-year-old man-child who tries to sabotage his mom’s (Marissa Tomei) relationship with the new man in her life (John C. Reilly). 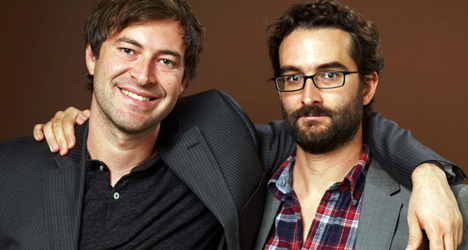 During my interview with the Duplass brothers at the 2010 South by Southwest Film Festival in March, the two talked about working with more established actors and what happens when they actually disagree about something during production. Was the experience different working with more established actors? 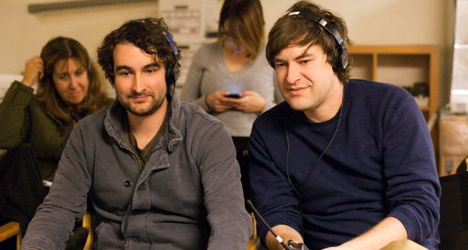 Jay Duplass: The hardest part is their schedules. (Laughs) That’s basically it. Mark Duplass: Yeah, they’re busy. JD: Yeah, they’re really busy human beings. But honestly, working with them personally, the one thing that we learned when we started dealing with really established actors is that they’re there for a reason. They’re really, really good at what they do. Mark and I were really blow away with what they bring to set on a daily basis. What is your mind set like having to handle the relationship between Cyrus and his mom and how do make it awkward without going into that creepy tone? MD: The way we make movies, a lot of stuff is open to interpretation for audiences. Some people look at “Cyrus” and think it’s vastly inappropriate. Some people look at it and think, “Hey, I can see that relationship. I have something similar.” And we love that about it. If you’re weird like those guys then you’ll feel like your home. If you’re a little less weird than them they’ll just be a little off and interesting to be with. Whatever you take is fine with us. You’ve talked in the past about these 30-minute walks you take in the middle of production that freak out your producers. Can you tell me a bit more about those and is there always a conclusion or answer to them? JD: Yeah, sometimes we don’t really have a full-blown conclusion but we always come back with something we’re gonna do whether or not that something that we feel is great or whatever. But the most important thing that Mark and I try to maintain is that we’ve added all these crew members to our process [and] we still want to just check in with each other and make sure that we’re connected about the piece of art that we’re making and what’s really happening in front of us because it’s so easy to just get caught up on the set and go with the flow on this massive beast that a film set is. We just want to make sure we’re staying true to the core elements, which are the characters, their relationships with one another, and how that story is unfolding. What happens when you two disagree on one of these elements? MD: We rarely disagree, honestly, but when we do it usually becomes obvious in the next five or 10 minutes that one of us is right. There is a very distinct lack of ego between us. JD: It really all comes down to who’s more inspired about their particular idea. We may have a difference of ideas, but we’ll start talking it out and it becomes obvious at a certain point that somebody’s really on to something. It’s not necessarily that they’re even right or whatever, but it’s like that’s where the love is and that’s where we always go. Would you ever think about doing separate projects, or is that blasphemy? MD: That would be blasphemy, but more importantly our mother would cry. I could see your two movies opening up on the same night and she’d have to make a decision on which one to go to. MD: That would be terrible, yeah. But we do have our things that we do on the side. Jay makes little, small doc portraits and I do some acting stuff on the side, so that’s a good way to keep it healthy.